So, you’ve got your new windows and doors. All of your weather-stripping is in place and your house is sealed against the elements. You may think you’re all set for the approaching cold weather. Many people think since their attics are already insulated, there’s nothing more to do upstairs. The fact is, your attic insulation can settle over time, thus reducing its ‘R’ value and becoming less effective. Even if that’s the case, don’t worry. You can safely add more insulation right over the existing layer. To check if you need more insulation in the attic, head on up with a flashlight or flip on the light switch. Take a look across the attic floor. If the insulation is either even with the floor joists or below them, it’s probably a good idea to add more. If you can’t see the joists at all, you’re probably still in good shape -- adding more probably wouldn’t yield much in the way of savings to cover the cost of buying more. When adding insulation on top of an existing layer, use only un-faced rolls of insulation. Measure the distance between joists so you can select the correct width when purchasing insulation. It’s ok to add loose, blown-in insulation over batts of fiberglass. However, because of the equipment needed and the importance of creating an even layer, you may want to hire the job professionally. If you feel up to the task, many places will rent out the necessary equipment. 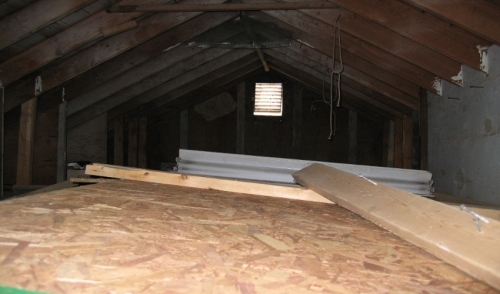 Use a sheet of plywood when traversing the attic floor to avoid damage and/or injury. Install batts from the perimeter of the attic floor to the center. This will make it easier to make your final cuts in the middle of the attic, rather than out near the eaves, where lack of work space can make the task cumbersome. If the existing layer of insulation is close enough to the top of the joists, consider laying the new layer perpendicular to the joists, making for a more complete layer. This will reduce what is known as “thermal bridging” across the joists. Lastly, don’t forget to cover the attic’s trap door with a layer of insulation. Though the savings can be substantial, the cost of this project is relatively low. Not only that, laying insulation is easy to do and can be accomplished within a weekend. If you’ve decided that your attic is a candidate for a few more inches of insulation, take your measurements and stop in. Our staff will be happy to answer your questions and help you to calculate how much you need and select the best choice of insulation for your home.